Always looking for innovative picnic food, I came across an old recipe of mine for scotch eggs. These retro globes seem to have vanished off the face of the earth as a popular food and were all the rage when I was a kid, along with Tupperware and Globite school bags. The likely fall from favour of the scotch egg was probably that they were deep fried. This recipe is baked in the oven, with the additional kick of a few extra herbs and spices. The other reason to drag my recipe into the twenty first century was because a friends’ ravenous teenage boy came to stay with us and he tried a scotch egg for the first time. The double protein hit of meat and egg provided perfect finger food fodder for his school lunch box. For this demographic, if you really want to hit the spot, split a bread roll in half, remove some of the bread from the middle of each half and nestle the scotch egg inside the roll. Add a good squirt of sauce and you have enough protein and carbs to keep the wolf from the door for a teenage boy’s school lunch or his after school fridge raid. Preheat the oven to 200C. Line a tray with baking paper. Place 4 eggs into a large saucepan of cold, salted water. Bring to the boil, then immediately reduce it to a simmer and cook the eggs for 8 minutes. Drain the saucepan and run the eggs under cold water from the tap, then peel them and set aside. You can do this step ahead of time and leave the eggs in the fridge, unpeeled till you are ready. Meanwhile, place the flour in a shallow bowl or plate and season with salt and pepper. Break the remaining egg into a second bowl and beat lightly. Place the breadcrumbs in a third bowl and line up all the bowls in a row, starting with the flour bowl, then the egg, then the breadcrumbs bowl. Squeeze the sausage meat out of their casings into a bowl and discard the sausage casings. To the sausage meat, add the bacon, thyme, parsley, nutmeg and cayenne pepper, mixing with your hands until evenly combined. To assemble the eggs, flour your hands, then scoop out a large ball of sausage meat and flatten it into an oval shape in your hand. Wrap the sausage meat around the egg, pinching it together at the seam, smoothing the meat around the eggs, making sure there are no gaps where the egg is peeking through. Dredge the sausage-covered egg in the flour, tapping off any excess. Set the wrapped egg on the lined baking tray, repeating the process with the remaining eggs. Once all the eggs are wrapped in their sausage blankets and floured, dip each one in the beaten egg, making sure it all gets coated, then roll it in the breadcrumbs, ensuring it’s fully covered in crumbs, pressing gently. Place the finished egg back on the lined baking tray, then repeat with the remaining eggs. Place the eggs in the oven and cook for 25 to 30 minutes, until the breadcrumbs are crispy and the sausage is cooked through. The surface of the scotch eggs should be crazed, cracked and crunchy. Scotch eggs can be eaten warm, cold or at room temperature and make perfect lunch box or picnic food. Store in the fridge for up to three days. With the challenging morning ritual of filling school lunch boxes fast approaching, so is the dilemma of finding something appetizing and somewhat healthy to put in them. There aren’t too many kids I know who will refuse a pancake, and with fruit and vegetables hidden within, these are a tasty and satisfying way of ensuring vegetables are on the school menu. If your kids are old enough, they might even like to help prepare or cook the pancakes themselves. The idea of combining fruit and vegetables in pancakes was initially brought to me by our daughter who decided she wanted to put everything in hers. The combination of flavours lends a slight sweetness, which she loved. Just remember to squeeze out the juices from both the apple and vegetables and you will have dry, crispy pancakes that should keep fresh in a lunch box without going soggy. The combinations are endless, and depending on the palate of your little diners, you can add spices, different cheeses or herbs to these pancakes to vary the flavours. Regardless of the combinations, if you are serving them hot and want to add an extra touch, a few dollops of greek yoghurt adds further body and balance to these pancakes. These are the perfect lunch finger food and kids will find them even tastier when they are involved in the making. Remove the husks and silk from the corn cob, and slice the end off it so it has a flat bottom. Standing the cob up on a board with the flat side down, use a sharp knife to cut the kernels from the corn cob. Discard the cob and set the kernels aside. Using your hands, squeeze the grated zucchini, carrot and apple to remove the excess juice. Place the in a large bowl, add the squeeze of lemon juice, and mix until well combined. The juice squeezed from the carrot, apple and zucchini is delicious to drink. Add the corn cobs to the mixed grated fruit and vegetables. Sift the flour and baking powder together into a separate bowl. Whisk the milk, yoghurt and eggs together in a jug and add to the flour, mixing until well combined and the batter is smooth. 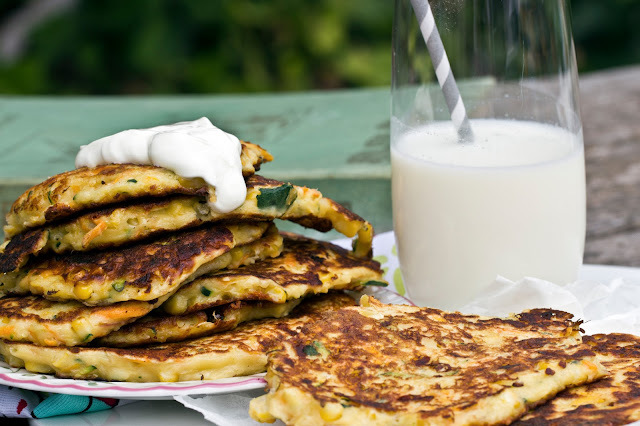 Add the batter and grated cheese to the zucchini, carrot, corn and apple and mix well together. Heat a little of the oil in a large, non-stick frying pan over a medium heat. Spoon two tablespoons of the batter mixture into the pan to make one pancake. Cook pancakes in batches, for three to four minutes each side until golden through. Using a spatula, transfer pancakes to a plate lined with paper towel. Repeat with remaining oil and batter.